There are few food items that cause as much of a divide as Native American frybread. Even the name causes dissent – it is known by many as the base of the “Indian taco,” using a term that many indigenous peoples find offensive. While some blame it for the high rates of obesity in Native American communities and point out its roots in oppression, others embrace it as a symbol of unity and, thanks to its rising popularity, financial freedom. We spoke with Lorenzo Emerson, owner of Emerson Frybread, about his experiences with the fried dough. There are hundreds of tribes whose origins are spread across the country, meaning there is no single “traditional” Native American diet. For a true look into the diversity of traditional indigenous diets, you’d need to ask about a specific tribe. For example, the Navajo farmed squash, corn, and beans and hunted prairie dogs and deer for meat, while the Cherokee farmed potatoes, pumpkin, gourds, and corn, and often ate fish and turkey for meat. Frybread’s origins contribute to the debate surrounding whether or not it qualifies as a traditional Native American food. The food was invented about 150 years ago, when the United States government forcibly relocated tribes from Arizona. Many of these tribes farmed for sustenance, so when they were placed onto land that couldn’t support their traditional vegetables and beans, the government provided commodities like canned goods, white flour, sugar, and lard. Native American women had no experience with white flour, but it didn’t take them long to combine it with baking soda and lard to create frybread. Because the commodity goods provided to the tribes varied by region, some tribes include different ingredients, such as dried milk or eggs, but the end result looked similar: round, fluffy, and delicious. Once tribes were able to start farming on the reservations, more could be added to the frybread. Considering its origins, what has led to the emotional attachment that many have to frybread? The answer lies in what has come to be known in English as powwows, inter-tribal gatherings that celebrate a variety of tribal cultures. Powwows generally revolve around singing and dancing, but because they often last several days, food is also an integral part of the celebration. For several generations, frybread has been a part of powwows, leading many Native American people to associate frybread with those happy weekends full of friends and culture. In fact, that’s how Emerson Frybread got its start. Frybread has become such an integral part of Native American culture as a whole that there’s even a song about it by Keith Secola, an Ojibwa musician. 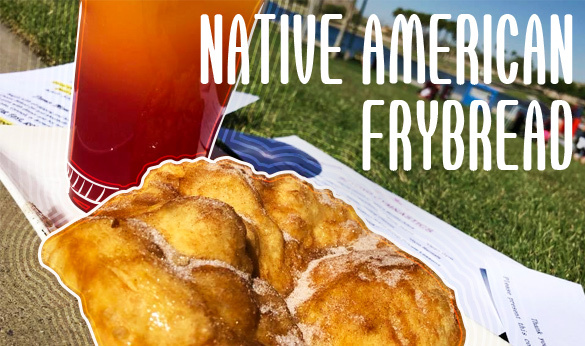 This emotional connection combined with the delicious flavor and versatility of frybread has given the food an impressive staying power, and has contributed to its recent rise in popularity. Lorenzo Emerson has a combination of family history, heritage, and culinary skill that helps ensure a level of authenticity that resonates with customers looking for true frybread. While adhering to tradition could seem constraining to some, Emerson takes those original recipes and innovates with them. Emerson has experience in a wide range of high-end kitchens and is completing a culinary degree, so applying that to frybread has meant getting a little creative. If you’re interested in trying frybread, find a powwow or Native American-owned restaurant or food truck near you.